Time of year: March/April and it was the perfect time weather and crowd wise, the roads were empty and the temperatures just right (warm during the day and chilly at night). Upon arrival we rented a little Peugot 301 from the airport, something I would definitely recommend if you want to see things around Jordan and don't want to depend on a guide. Grab a sim card with some data, throw on Google Maps and you're good to go! We only stayed here a few hours for lunch and a stroll so we didn't get to see much of Amman, but the area around Jabal is very cute, young and hip and a nice spot for lunch. Where we ate - Books@Cafe when you have to enter through the bookshop to get to the restaurant you know it's going to be a nice spot. We had breakfast here and went straight for the labneh, zaatar and halloumi with Arabic bread on the terrace with an incredible view over Amman. You could hear the prayer calls from the entire city as everyone started going about their day. This is definitely where you want to have a meal if you ever find yourself in Amman. DO IT! There is nothing more novel than floating without having to try. But seriously do NOT get any of the water in your eye, it will feel like it is on fire. 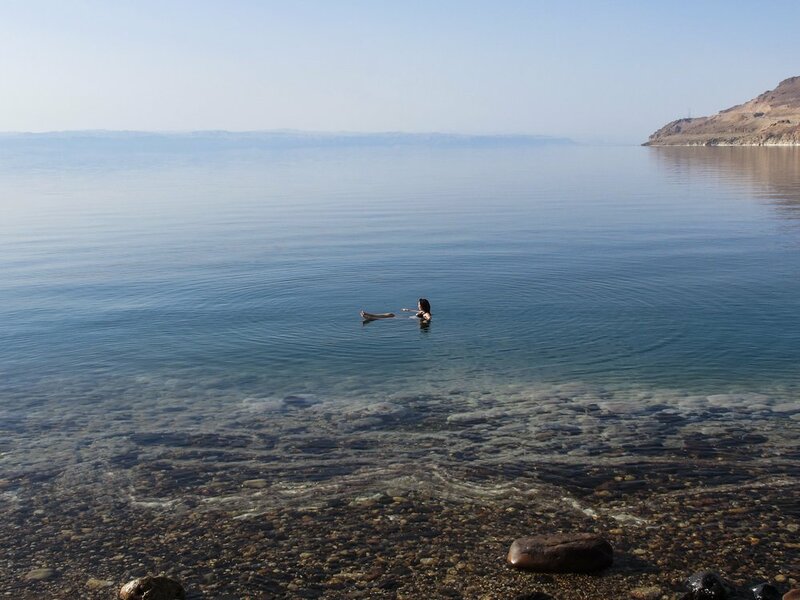 We stayed in the southern part of the Dead Sea at the Mujib Chalets (more below). Try to organize some mud from where you're staying, rub it on and let it sit for 15min before you get in the sea, your skin will feel like brand new. Even days after my skin felt baby soft and my hair too from the salt water. Where we stayed - Mujib Chalets, I haven't seen what the other places look like because there isn't much close-by but this is where you want to go. The chalets are basic, clean and quiet with the best view of the Dead Sea and I mean that. There isn't much around for the next 10-20km so you're the only ones there, apart from the occasional car passing by you don't hear a thing, the view and serenity at this place is everyhting. Where we ate - When we were there the chef decided to take the day off so we went into the village 20km south and grabbed our dinner there. We found a stand by the side of the road that offered some chicken and coriander wrapped in Arabic bread and we hit up the sweet shop next door for some kenefe and baklava for desert. We went twice, first at 3pm and walked around until sunset which is beautiful there (added bonus, there's not such a big crowd as they stop letting people in at 5.30pm). The next day we got up at the crack of dawn and were at the gates for 6.30am and it was just as empty as we'd hoped. I highly recommend getting there extra early to enjoy Petra to yourself, there are also less street vendors and the weather is perfect. Petra means 'rock' in greek, which isn't surprising considering this city was carved out of sandstone rockface over 2000 years ago. - A ticket for one day is 50dinar (exc. taxes) and a 2 day is 55dinar (bring your passport, they will want to see it). - Be conscious of the signs of what to do and not to do in Petra (if you're quite large, refrain from sitting on poor donkeys to carry you up 700 steps, don't buy postcards from kids who should be in school and I can't believe I have to say this but don't litter in Petra). The vendors aren't pushy at all and you can have a chat with them and ask them for tips on where to go up no problem, but be aware that they would like to sell you something so don't lead them on. - Be prepared to walk a lot and ask around if you don't know where to go up for a viewing point because there are plenty and you should try to at least get to one. We went to the Monastery and the Sacrifice High Place (this one was quite a hike but SO worth it). Where we stayed - Petra Marriott Hotel, it is tucked away outside of the town and up the hill with a beautiful view. It's a bit on the fancier side but the view from there is so worth it and it's nice to be out of town because it can get a bit touristy. Where we ate - The Oriental Restaurant, the staff were super nice here and speedy. The food was delicious, we stuck with Arabic food because I just couldn't get enough fattoush and cheese sambousek on this trip. Where we drank - The Red Cave Bar, this is probably the most rewarding drink you will have after a long wander through Petra (do this after your sunset walk). You can sit outside or in the cave (yes a real cave) and enjoy one of their cocktails that they are so proud of, I had an amaretto based one and it was yum! We stayed in Aqaba for one night and went for a wreck dive (the Cedar Pride) in the Red Sea the next morning. I've heard great things of the Red Sea and it did not disappoint, the water was crystal clear at 15m and the sea life was bussling (we even saw a massive octopus hiding in the reef). Where we ate - Mataam Al Kudra, this is a family owned restaurant and very local so if you want to find this place (and I suggest you do because their falafel was top notch, needless to say I walked away a human falafel ) I would maybe show a photo from below to someone in the area to help you find it if you do make your way there. We had a late breakfast here and the place was packed. I've seen deserts and wadis galore but this place is something else entirely. We stayed in a camp (more info below) tucked away in the Wadi. There are plenty of bedouins around that you can arrange a little tour with, we did one and at every stop we just wandered off for a little bit. While it is not crowded there are a few other tourists with the same idea in mind so again, get an early start. Make sure to catch the sunset and stare at the stars late at night, they are incredible out there. Where we stayed - Wadi Rum Night Luxury Camp this place will make all your desert princess dreams come true. The camp is made up of many tents and a few pods that have been sold out since they first introduced them 3 months ago (we stayed in a beautiful tent tucked into one of the rock faces). The showers and bathrooms are separate and although shared they are super clean. Food is served in a communal dining tent (make sure to get there early to get all the good stuff) and is followed by some chai and shisha by the fire outside. Note: Before you drive into the Wadi there is a small 'town' with a parking lot. 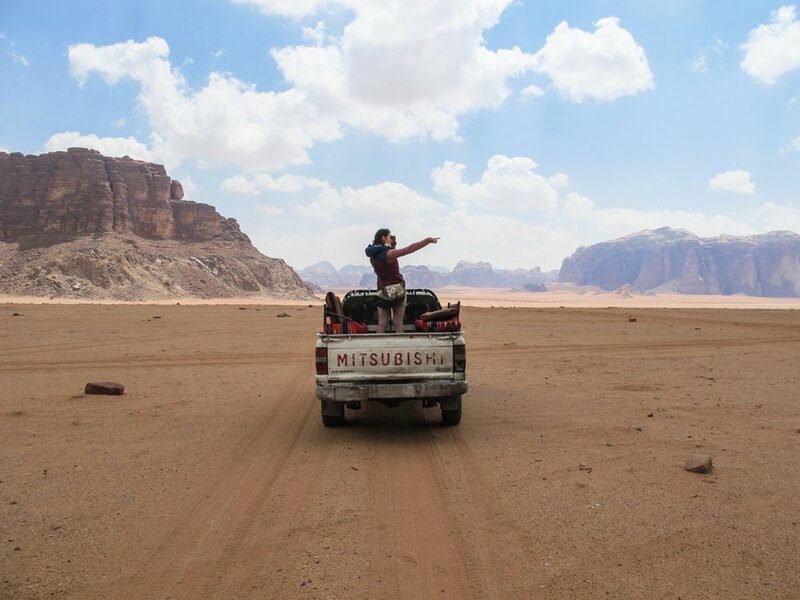 We didn't realize but you do seem to have the option to drive in but for Instagram and experience reasons do take a ride in with one of the bedouins, it's an adventure in itself (a very bumpy one). Where we stayed - Saint John Hotel, I wouldn't recommend staying here. We booked it last minute as we wanted to stay close to the airport on our last night but this place was pretty dirty. The staff were very kind and I've stayed in some budget places but the room just had a few too many left overs from the previous guests for my liking. They do have a good view from the bar at the top of the hotel. Just around the corner is the cutest book shop/social space you will find. The place is called Kawon and if you're lucky the owner Ghaith will be in and you can have a chat with him, believe me it will be enlightening!